I have over 700 recipes on this little website of mine, but very rarely do I cook like that at home. I prefer to keep it simple, especially after cooking throughout the week for the blog. And the simpler I keep it, the more I’ve been able to stick with healthy meals throughout the day, day after day. And since I’ve had this website for quite sometime now, I’ve heard MANY people complain that they don’t have enough time to cook a healthy meal. And I get it. Life is f*cking busy. Work, workouts, children, family stress, and whatever the hell else is going on makes it pretty easy to come up with excuses to NOT eat a well rounded, healthy meal. 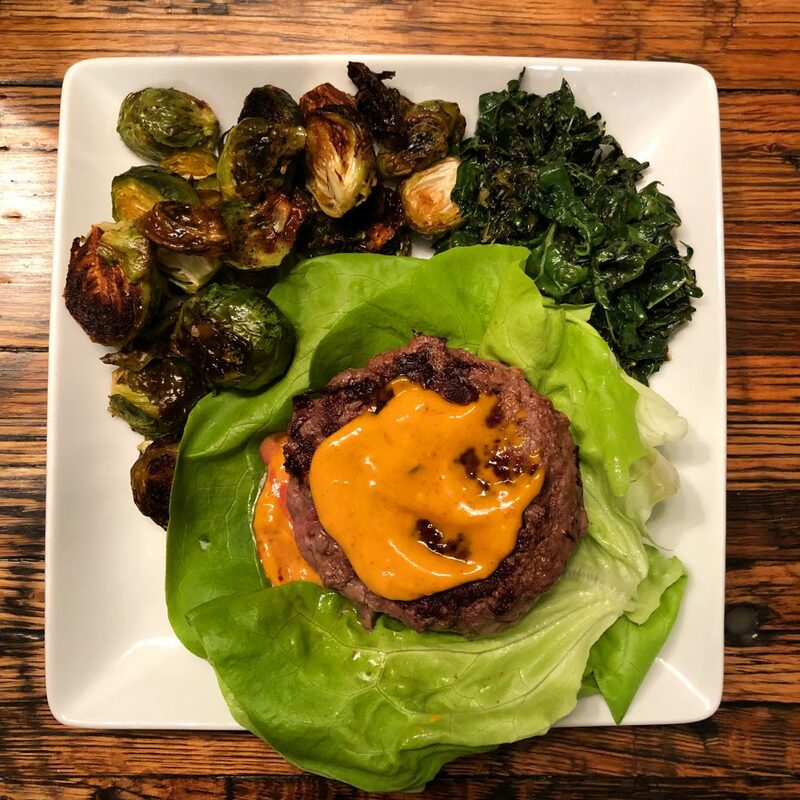 ButcherBox – Every month I get my monthly supply of grass-fed, grass-finished, antibiotic and hormone-free, pasture-raised beef, chicken and pork. This way I always have meat on hand that I can pull out of the freezer the day beforehand to make for meals the next day. And since it’s delivered to my doorstep, I don’t have to think about it, which is the best part. In every box, I always get burgers and breakfast sausage, then whatever other meat is available that month! Freezer section – I always like to purchase cauliflower rice, sliced bell peppers, asparagus, cauliflower and kale so if I’m in a pinch and have no fresh produce around, I can quickly defrost any of these vegetable and whip up a meal quickly. Produce section – I almost always purchase arugula, kale, carrots, cherry tomatoes, ripe plantains, yukon gold potatoes, sweet baby peppers, butter lettuce, honey crisp apples, cilantro, green onions and whatever other vegetable looks good. Pre-cut veggies – At Whole Foods (and many other grocery stores nowadays), they have pre-cut vegetables that have made a huge difference when it comes to how long it takes to make a meal. It costs a little more, but to me it’s worth it because it keeps me eating healthy. I’ll always buy pre-cut butternut squash fries, brussels sprouts, kale, beets (I buy the Love Beets brand), zucchini noodles, beet noodles, and carrot fries. Butcher section – Since I get all my meat from ButcherBox, I usually only purchase wild-caught fish and seafood at Whole Foods. We try to eat salmon, scallops, sea bass and whatever other fish looks good. And we’ve been eating more fish and seafood recently because my husband is on a strict diet where he can’t have chicken or pork, which is why most of my dinners are beef or fish/seafood. I love getting fish/seafood for the nights that we have limited time since it cooks up so quickly. Now let’s talk about my meals. 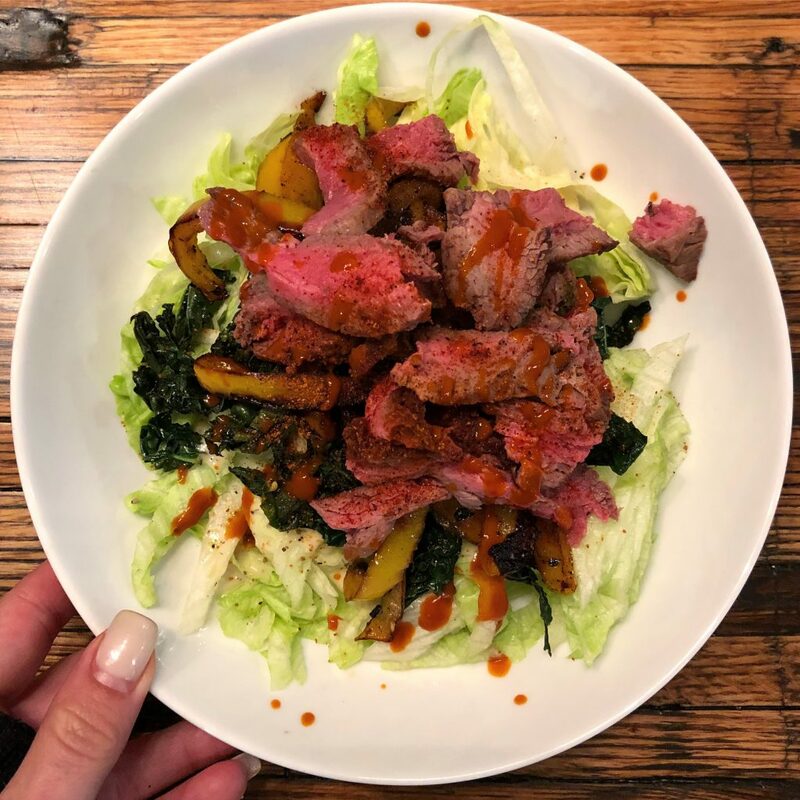 If you don’t already follow me on instagram, get to it because I share most of my meals every day to help you stay creative in your own kitchen! I have 16 meals here and I’m going to quickly break all of them down. I often use two pans to make things cook up quicker. It may mean more dishes but non-stick pans are easy to clean anyways, so it’s not that big of a deal! Since I stay away from eggs most of the time, I make hashes at home just without the eggs. This kind of meal takes about 10 minutes. 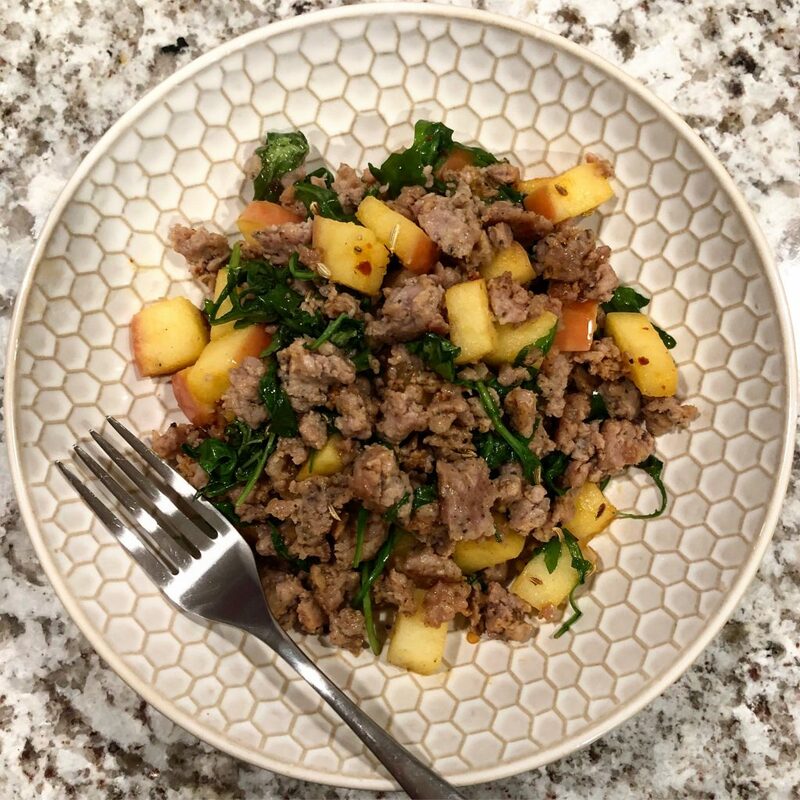 ButcherBox sausage cooked up, then 1/2 diced apple added along with a handful of arugula and some hot sauce. I heated up a cast iron skillet with ghee, and seasoned ButcherBox sirloin steaks with salt and garlic powder. Once hot, I cook the steaks for about 5 minutes per side, until medium rare, then I let the steak rest on a cutting board for 10 minutes before thinly slicing agains the grain. While the steaks rest, I add pre-cut kale to that same pan with a bunch of thinly sliced sweet peppers and cook for about 7-8 minutes, until soft and browned. Lately, I sliced up some iceberg lettuce, topped it with avocado oil ranch and hot sauce, then I topped it all off with taco seasonings. ButcherBox burger cooked in a cast iron skillet with ghee, seasoned with only salt and garlic powder. About 6-8 minutes per side. While the burger cooks, in another pan with ghee, I cooked up pre-cut beet noodles with salt and pepper. Last, I made an easy salad of arugula with avocado oil ranch. ButcherBox chicken tender diced up and added to a pan with ghee. Once almost cooked through, I add diced carrots and sliced sweet peppers and cook up with a little hot sauce. Once veggies are soft, I make a quick salad of arugula and avocado oil ranch. In a pan with ghee, I add kale and cook over medium heat with a little lemon juice, s&p and red pepper flakes until soft. Then in another pan with ghee, once hot I added scallops that I have salted on both sides. These scallops only have to cook for 3-5 minutes per side. 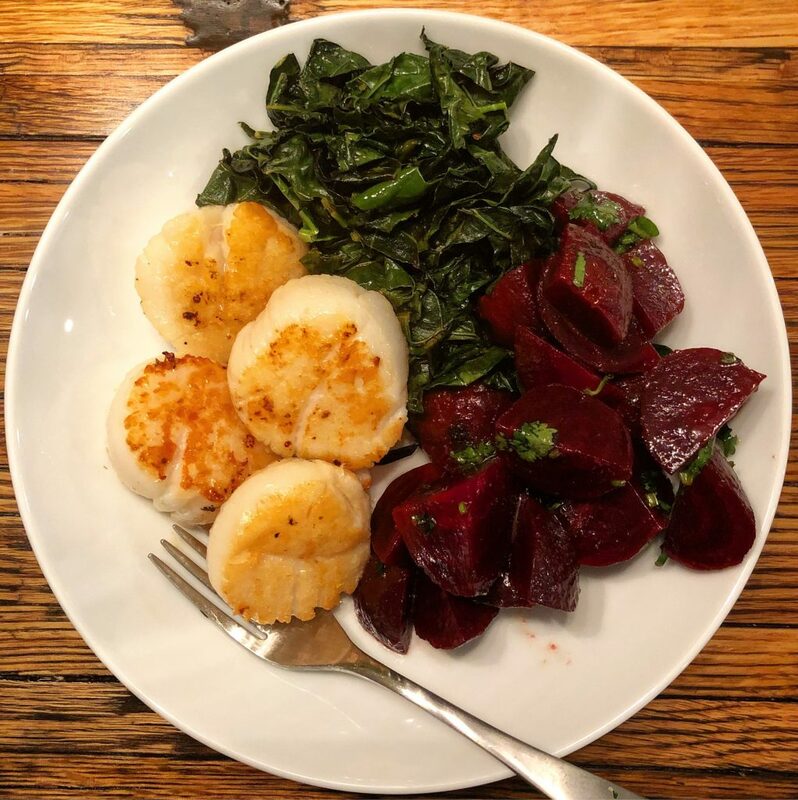 While the scallops and kale cook, I dice up Love Beets (which are already cooked and peeled) then I toss them in olive oil, lemon juice, parsley, and s&p. I toss these pre-cut butternut squash fries in avocado oil and roast at 400 degrees for about 30 minutes. While the fries roast, in one pan I cook up ButcherBox burgers in ghee, about 6-8 minutes per side. Then I top the burger with avocado oil mayo and ketchup. And while the burgers cook, in another pan I cooked up pre-cut kale, arugula and some diced red bell pepper in ghee then add a little lemon juice, garlic powder and s&p. After I made the tomato salad, in a large pan I added diced bell pepper to ghee and cooked until browned. Then added 2 pounds of ButcherBox ground beef. Once browned, I added taco seasonings, hot sauce and lime juice. 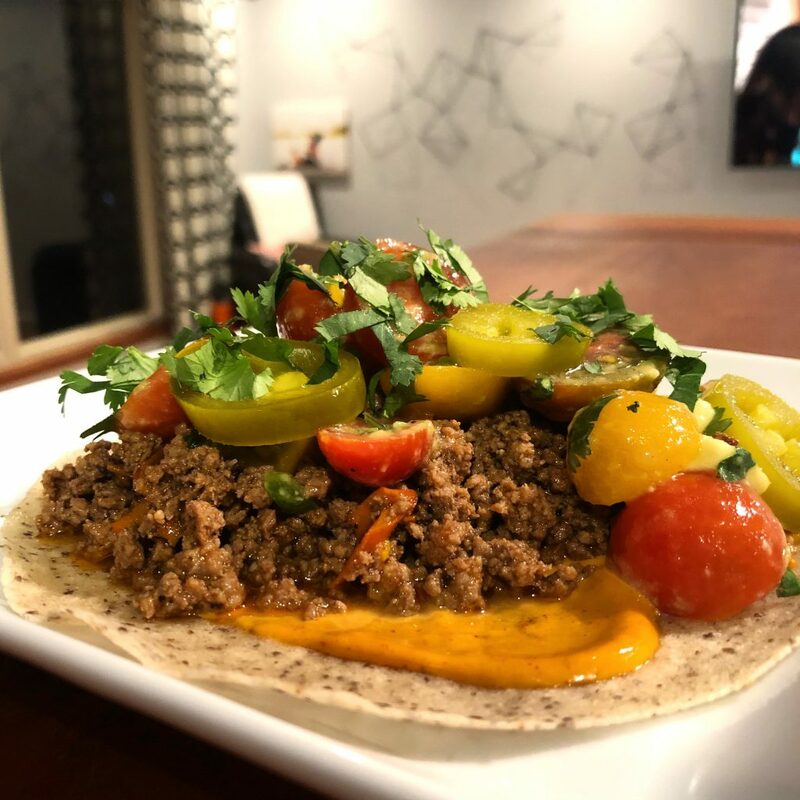 Then I made tacos with grain-free tortillas, chipotle mayo, jalapeño peppers, and cilantro. This is my chicken fried rice recipe, but I use ButcherBox ground beef instead. 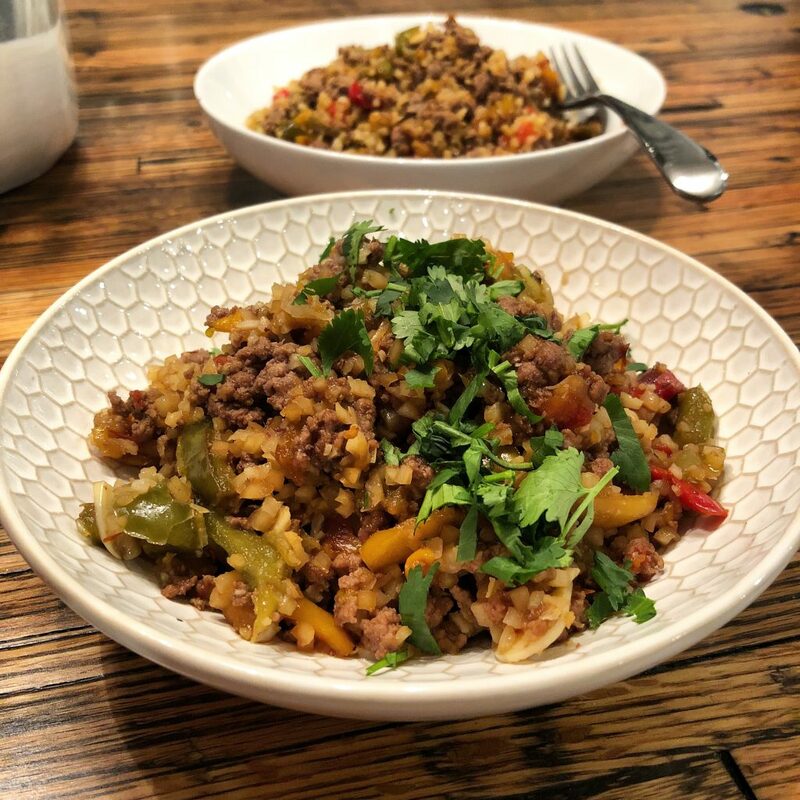 I also used thawed cauliflower rice and thawed pre-cut bell peppers to make this meal cook up even faster! While brussels sprouts cook, in a pan with ghee, I add kale and cook over medium heat with a little lemon juice, s&p and red pepper flakes until soft. Then in another pan I cook up ButcherBox burgers in ghee, about 6-8 minutes per side. Then I top the burger with chipotle mayo and put it in butter lettuce. This is my chicken fried rice recipe, but I use ButcherBox ground beef instead. 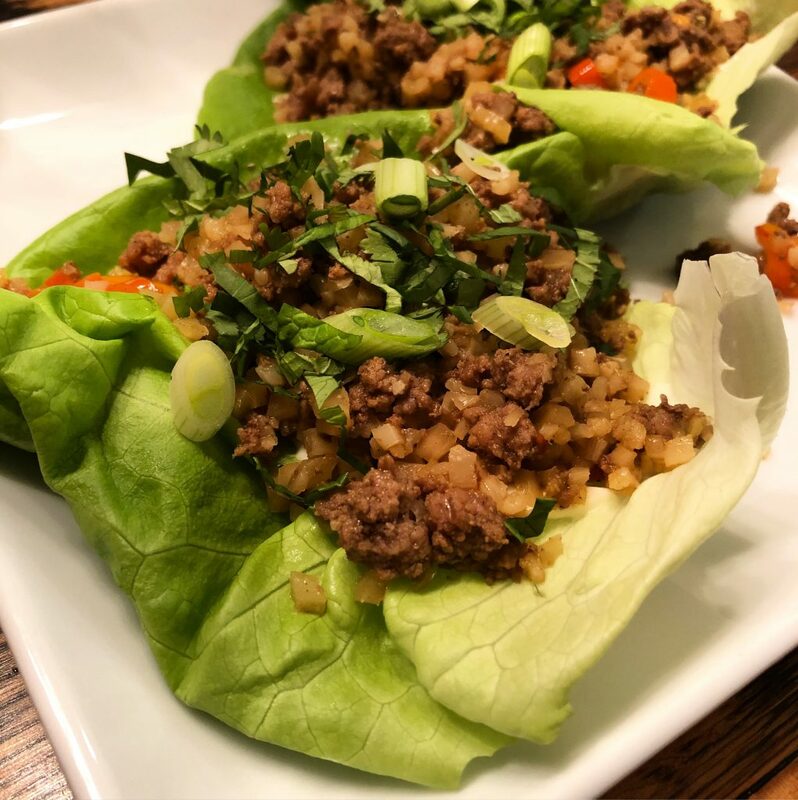 I also used thawed cauliflower rice and thawed pre-cut bell peppers to make this meal cook up even faster then put the recipe in butter lettuce cups! Last but not least, this meal takes about 30 minutes, but is worth the time since it has so many vegetables in it! In a pan with ghee, I cooked up pre-cut beet noodles with salt and pepper. In another pan with ghee, I cook up pre-cut zucchini noodle with salt and pepper. Once the beet noodles are soft and done cooking, I set aside and cover then add the kale to that pan to cook with a little garlic, lemon juice and s&p until soft. Then when the zucchini is done, I set aside and cover to keep warm. I add extra ghee to the pan then cook the scallops that I have salted on both sides for 3-5 minutes per side. And that’s that!! That’s 16 meals all cooked in under 30 minutes. And this is exactly what most meals look like for me. Since I started cooking like this more and more, I have felt better than ever. I sleep better, my stress levels are lower, and I have more energy than usual. 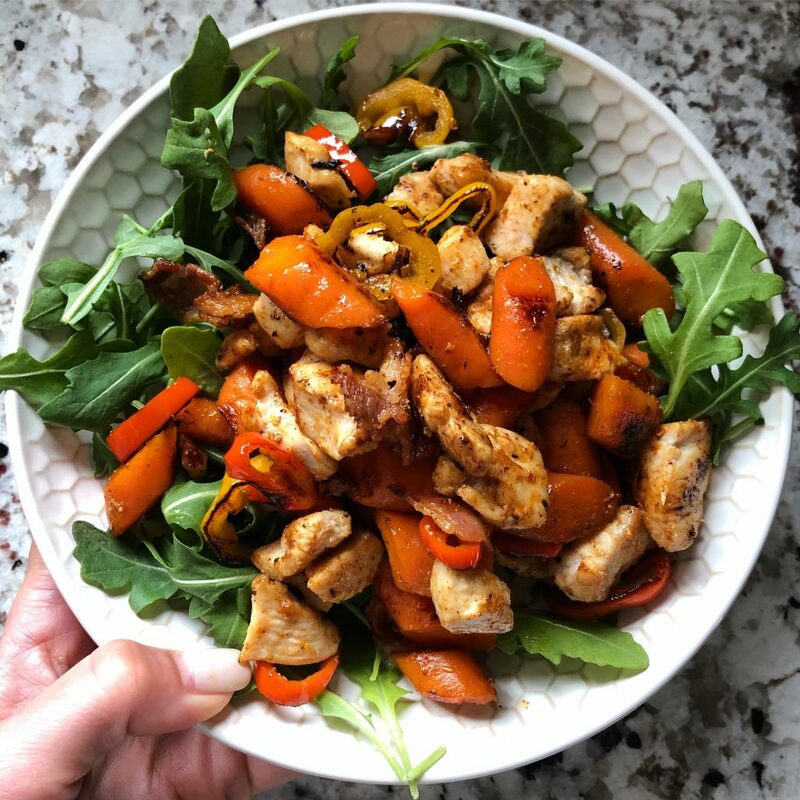 I hope showing you these quick meals help prove to you that eating healthy really is easy, you just sometimes have to keep it simple! Let me know if you have any questions about these simple meals and if I can help in any other ways! How do you handle your portion sizes? I have zoned in the past and am currently counting macros while on a 10 week strength and nutrition program. It gets a little tedious at times. You seem to have it down. Thank you! I plan on finishing out the program with macros that I am currently on with just a few weeks left. I don’t think it is a realistic lifestyle for me with weighing things , but has definitely made me more aware of how much I should be eating. That is usually my downfall. This is an awesome post! I love recipes but most nights I’m looking to make something quick and easy. Thanks for all of the simple ideas! Thank you so much! This is perfect timing because I am just starting to remove eggs from my diet, and now you’ve given me so many delicious looking breakfast ideas!!! it’s pretty damn easy to eat breakfast without eggs once you stop thinking of breakfast as just eggs haha! I can’t tell you how much I love this post! I mean, I totally love your super detailed, creative and beautiful recipes so please keep them coming but this simple post with easy meals was sooooo needed in my life, I’m great at protein but I find myself eating lots of spinach with oil & vinegar because it’s easy and thinking about sides is hard. I have some veggie noodles (carrot I think) that have been in my freezer for weeks just cause the thought of doing something fancy with them freaks me out. I’m totally making those for dinner tonight after seeing how simple you keep it! i totally do the same thing with arugula. but kale has been awesome to cook up quickly and any of those pre-cut veggies make it even easier! Love this post!! Definitely so helpful for quick and easy meals. I try to meal prep my week due to my job and it being difficult to cook during the week, and I love how easy these are for being on the go. Great idea for the freezer foods from whole foods, i’m going to look into it! Why don’t you eat eggs? Super helpful post! 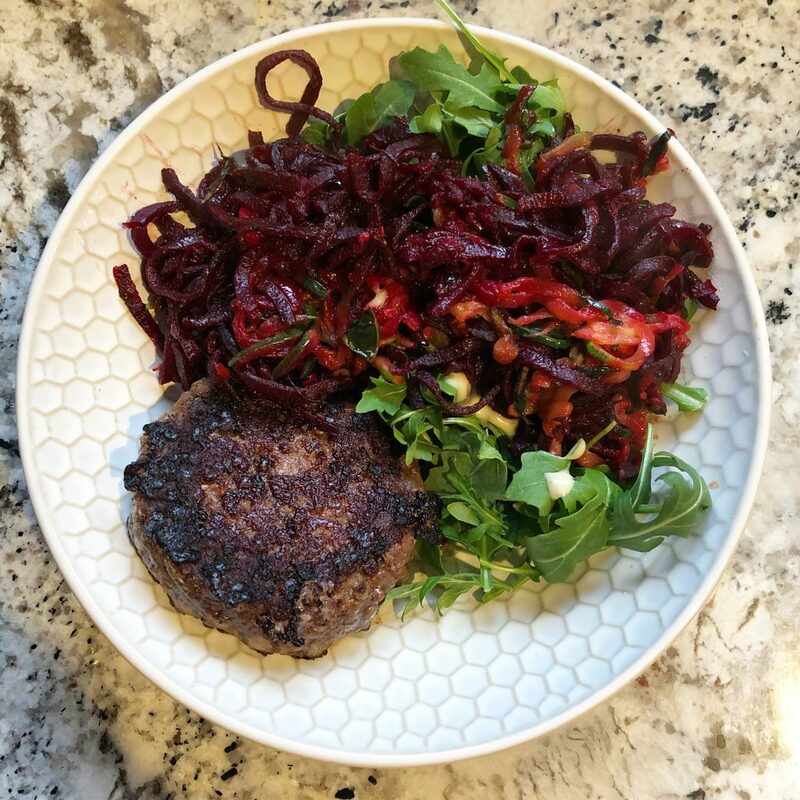 Love Butcher Box and your instagram posts are inspirational! This may be a dumb question… but do you thaw the BB burgers or just toss them on frozen? I’ve got some in my freezer right now and suddenly want a burger for dinner!! This is amazing. I have the hardest time planning meals without a “recipe” and this makes it sound so damn easy. You are the coolest. Thanks for sharing this post! The Costco I go to in north GA is selling LoveBeets in bulk, 5 packs for $5.99. It’s worth looking into in your area if you are a member or have a friend who’s a member who can buy it for you. I totally bought arugula the other day because of you. I’ve NEVER bought it! Thanks for the food inspiration. I am wondering if you could do a post some day on kitchen essentials like pans, gadgets and things and how you keep your pans clean? I use a ton of aluminum foil! I follow you on Instagram but just now had the chance to check out your blog. WOW! I love this post! I have been having trouble coming up with new ways to use the meat in my house. We usually have the same things, spaghetti, tacos, etc. I love your spin on it all! I am curious, what kind of ghee do you use? i linked the brand i use! Great tips. Looks delicious! THANK YOU! Huge YES to simple, easy meals full of real, whole ingredients! I cook this way myself, though local eggs make up the majority of my animal protein…plus a 2-burger meal on Fridays…and organ meat or canned fish once a week or so (cheap, easy, nutrient-dense). 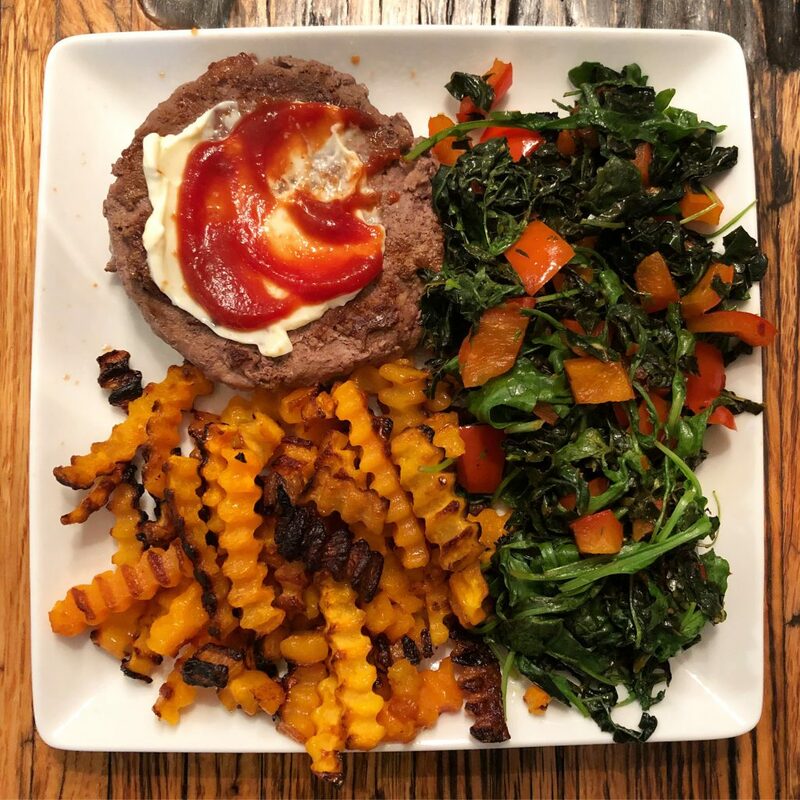 Also, I LOVE sharing this sort of post with my eating coaching clients – especially if they’re newer to paleo-primal and find the whole thing overwhelming. Love sharing it with my Chinese Medicine Nutrition students too, since they are usually stressed and short on time. Thank you! Thank you for taking the time to write this post. I love your recipes, but this is a great, realistic list of ideas that I can incorporate into my daily routine. Thanks for the inspiration! Several things: 1) I am totally obsessed with Kite Hill cream cheese now! Especially the jalapeño flavor! So damn good! 2) just caught up on your podcasts and you should have Courtney Kerr from kerrently on to talk beauty products and fashion And Dana Weiss aka Possessionista to talk fashion and all things bachelor! Oh! And maybe RealitySteve! Obviously I have no issue with bachelor talk on your blog and podcasts! 3) made your cucumber dill dip for super bowl and it was an absolute hit! 4) loving this post! Thanks for your awesome recipes and ideas! You’re the best! 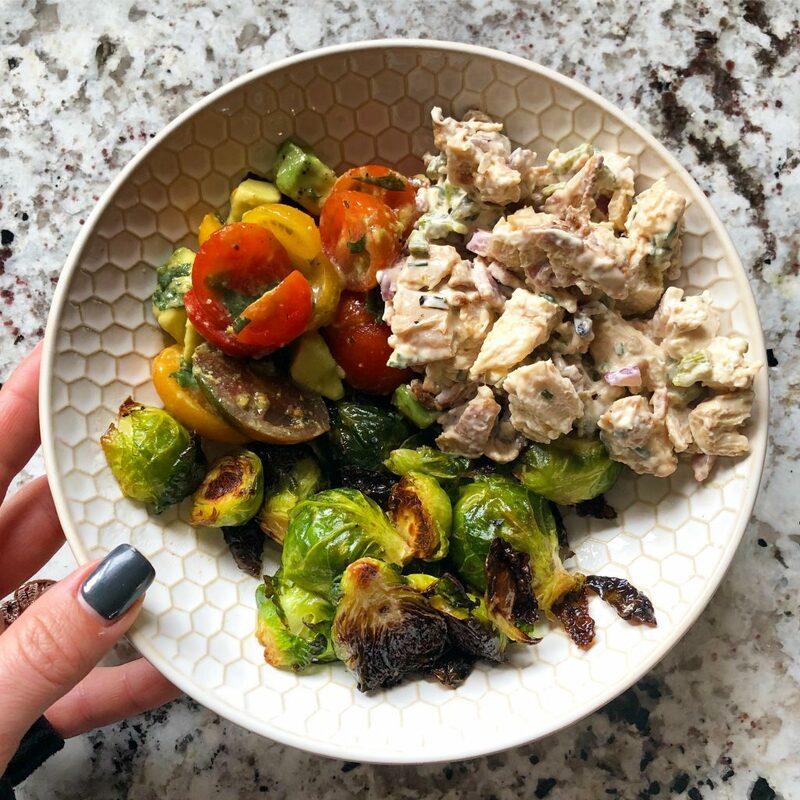 I love seeing what you are cooking – it gives me inspiration for my easy breakfast & lunches since I have very little motivation for cooking at those two times of the day. Thank you for posting this! 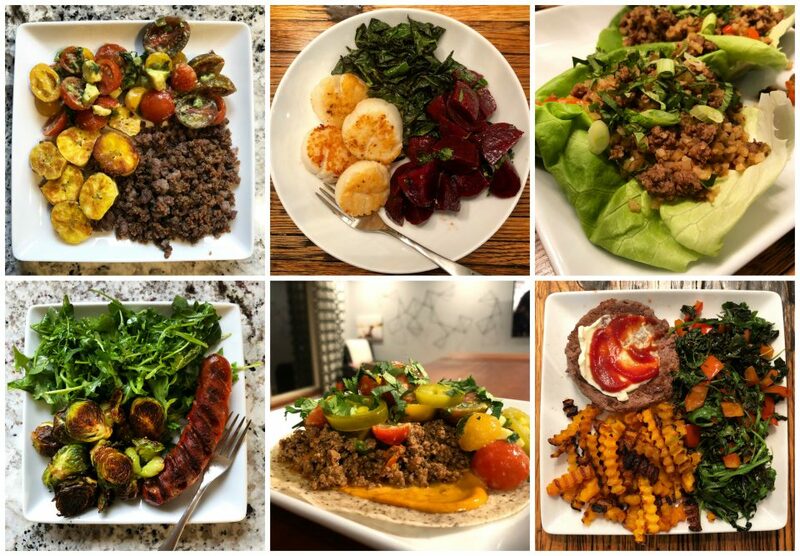 I love it when you post meals like this on instagram, I get so many great ideas from them, but to have all of these meals together in the one post makes it so much easier to get inspiration and ideas for healthy meals. Love it! Love this post!!! 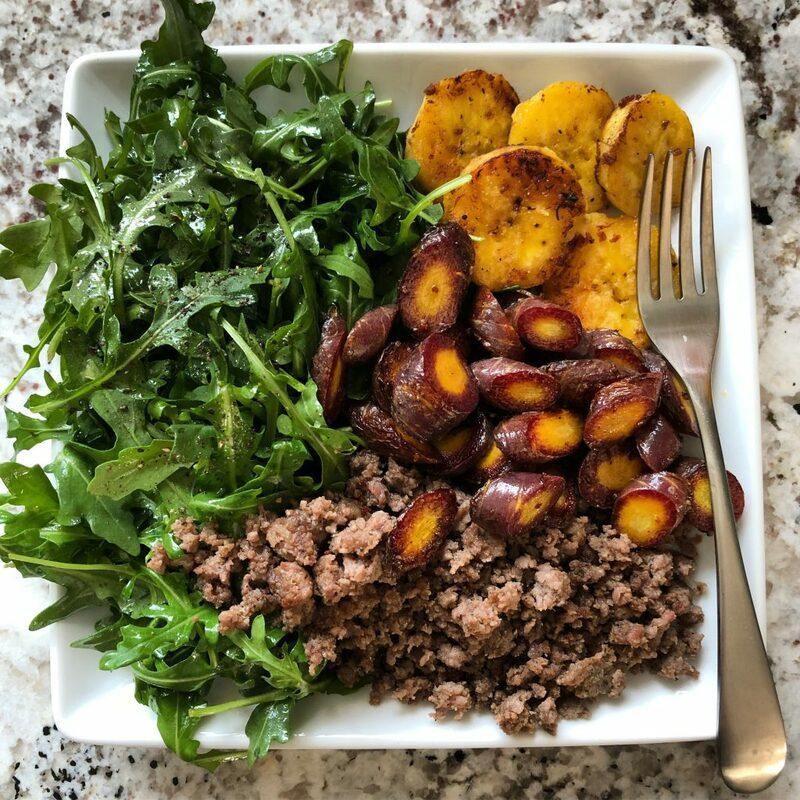 I am always looking for new ideas for quick and simple workday meals since I work shiftwork and often only have 30-45 mins to prep cook and eat before heading to work in the afternoon! I recently started making a batch of chicken salad on my last day off to have on hand for quick grab and go meals for those days I either lose track of time while hiking in the morning or just have too much housework to get done before work. Besides these quick meals, do you have any go to items you prep ahead for the week? Hi Julie, I was wondering if you knew of something like butcher box for Canada? love you blog and recipes! thanks! would love to hear more about the diet your husband is on.. never heard of one that cuts out chicken and pork. sounds interesting! This is my favorite post. I tend to get into a rut with my meals. This will help me break out! Any recommendations for good quality cast iron skillets/non-stick pans to cook all the recipes above?? I just have a plain old lodge cast iron. you can find them everywhere! walmart, target, bed bath and beyond. i’ve even seem them at Cabella’s and at the cracker barrel store, ha! you just have to research how to care for it and that was a little intimidating to me but now it’s my go-to skillet! I think Juli uses these too. Question about the kale. In the grocery rundown, you mention kale from the freezer section and also kale from the produce section. Are you using both of these interchangeably as the kale that you saute in ghee? Is there a certain brand that you recommend? I feel like the kale I purchase is very hit or miss on whether it tastes good or not. also i’d love it if you had Jessie Golden as a podcast guest! I want to hear more about meditation and her experiences with it. Like how to get started and all that. I love this post!! No excuses!! You’re such an inspiration gf! Really love this post. 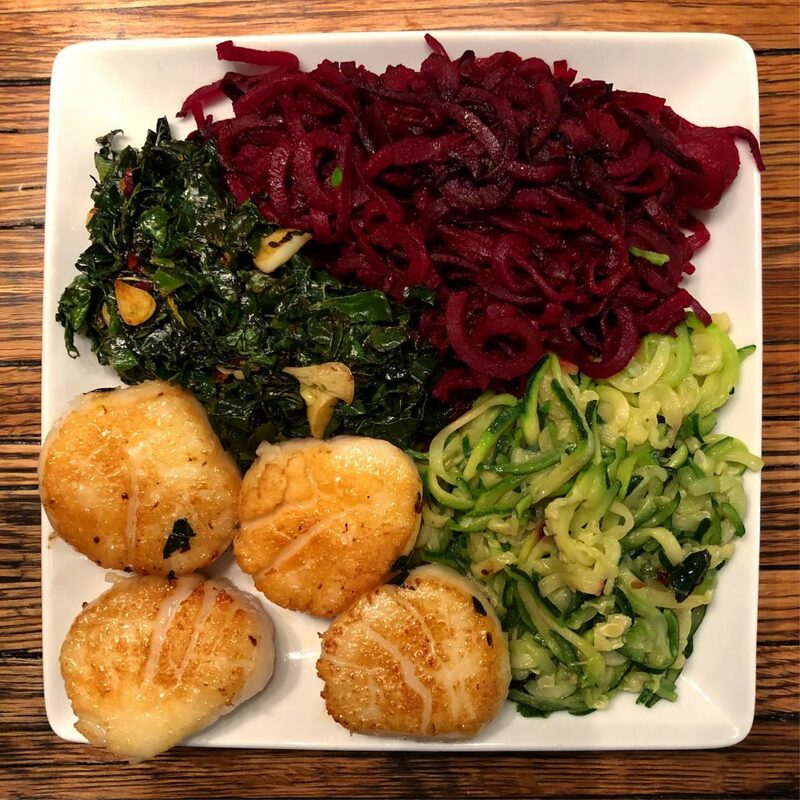 Now I want to make scallops this weekend! I love this post – thank you for sharing! It’s easy to feel the need to make big fancy meals all the time bc of social media, but love the realness of this post. Simple & delicious! Thank you! This post is so helpful. Thank you. I notice you eat a lot of plantains. I’m just starting to warm up to them, but haven’t had much success. Can you provide tips on what color to look for and how to peel them easier? I made the spicy stuffed plantains from your cook book last night and they came out super hard and unpleasant. I don’t think it’s any fault of the recipe just my lack of knowledge of this ingredient. i look for brown and soft plantains that are easy to peel. Thank you so much for posting this! I didn’t realize it until I saw this but my fam was definitely in need of a “kept it simple” reset – everything else has been so overwhelming lately. You’re the best! This is one of my favorite posts you’ve ever done! Would love to see periodic posts like this one. Thanks! Any particular reason you avoid eggs? 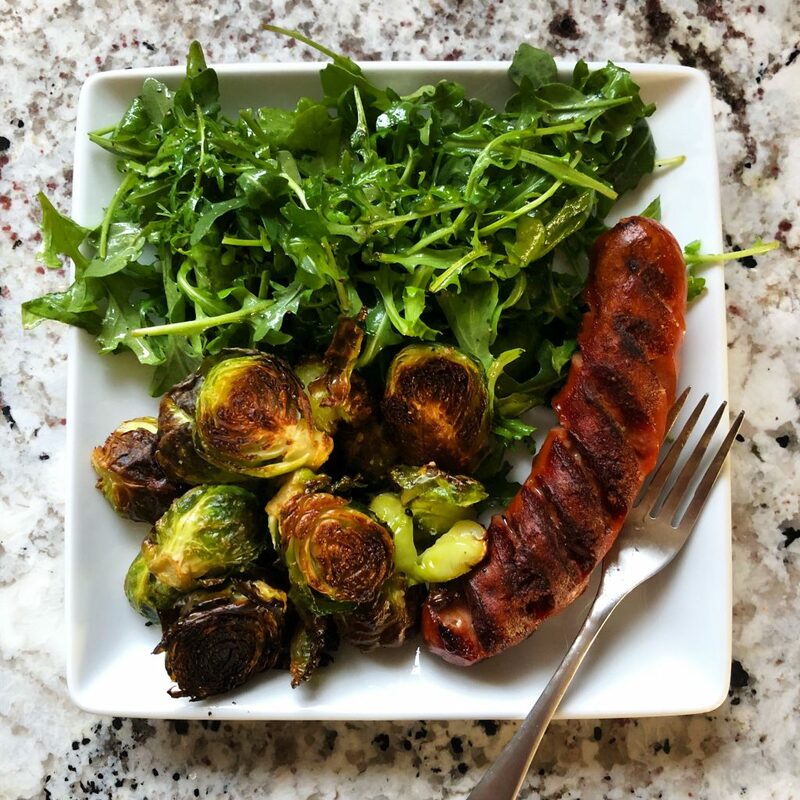 This is probably silly, but is there a particular way you cook the arugula? Do you put it all in a pan together (lemon, olive oil)? …asking for a friend who may have just REALLY messed up the proportions. Hi Juli! 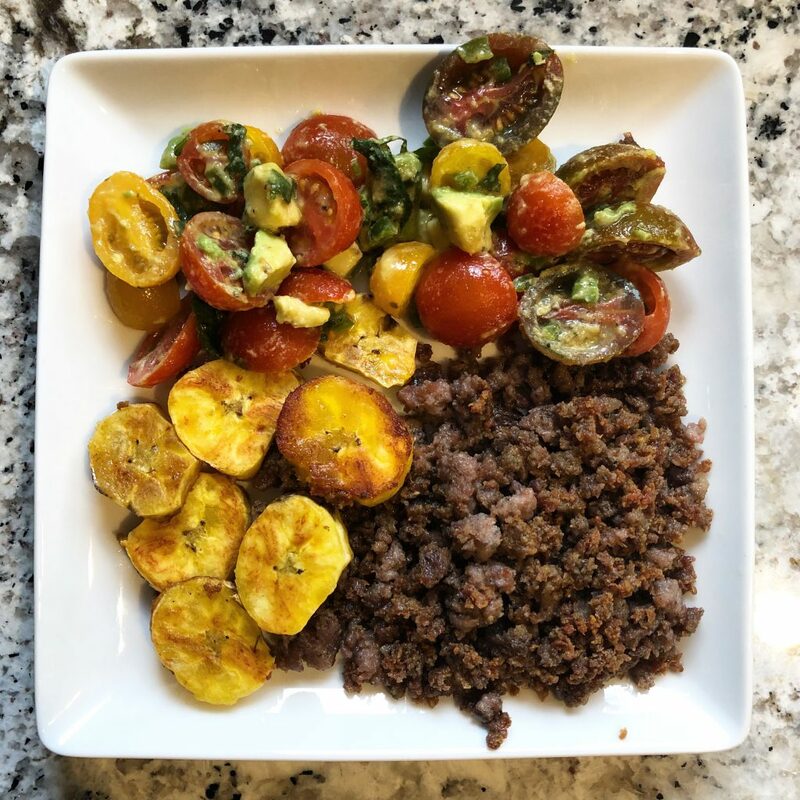 I have never cooked with plantains before, but would love to learn how! How do you know plantains are ripe? Also, do you have a post or video on how you cook them? plantains are ripe when they are usually brown and soft and the people comes off easily. Hi Juli! My husband and I are going to try Butcher Box! Quick question, are orders delivered the same day every month? I’m just curious, if I signed up now and chose my plan, would I have to wait until the next delivery date (for example next month) to get it or would they ship my stuff now? Thanks! they don’t normally come the exact same day but i also don’t pay much attention lol, but i think you can set your date! The recipes are all amazing. Definitely going to purchase. 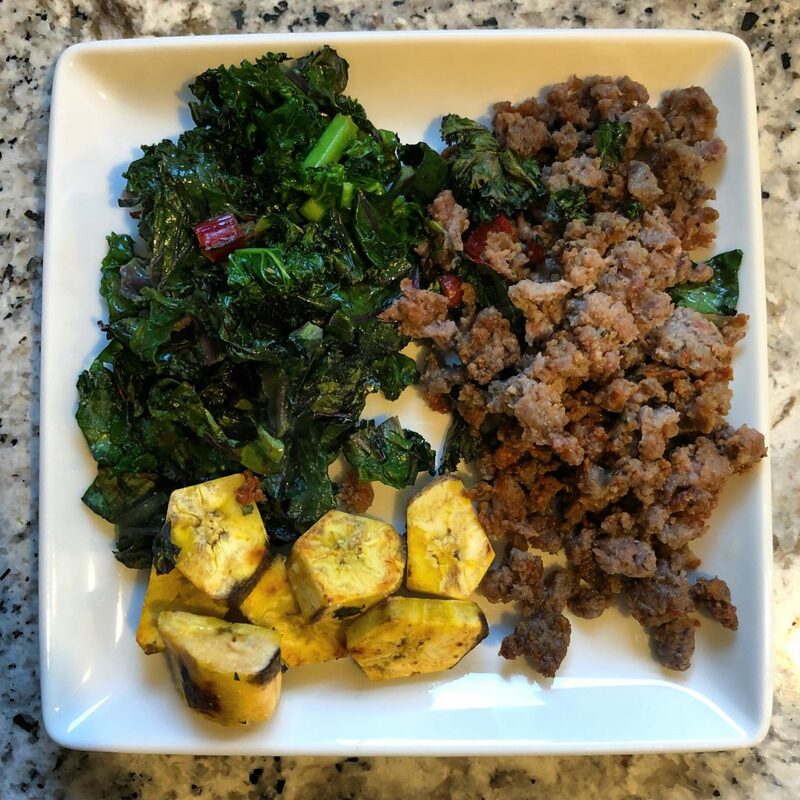 What’s seasons do you use for your cauliflower rice ?